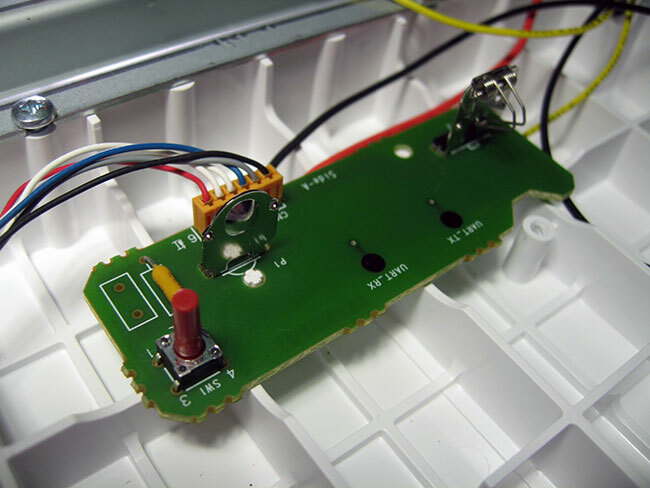 This tutorial describes how to add a 5 volt power supply to your Wii Balance Board. To some this might seem like blasphemy. 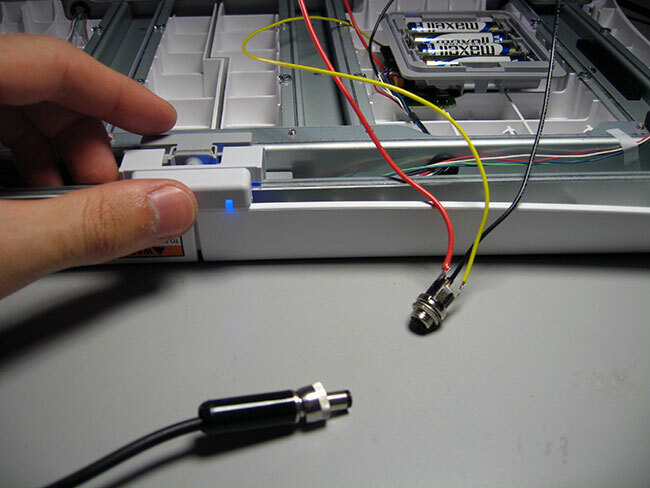 Adding a wired connection to a wireless device, who would do such a ridiculous thing? Well, we did, and we thought some others may want to do just the same. 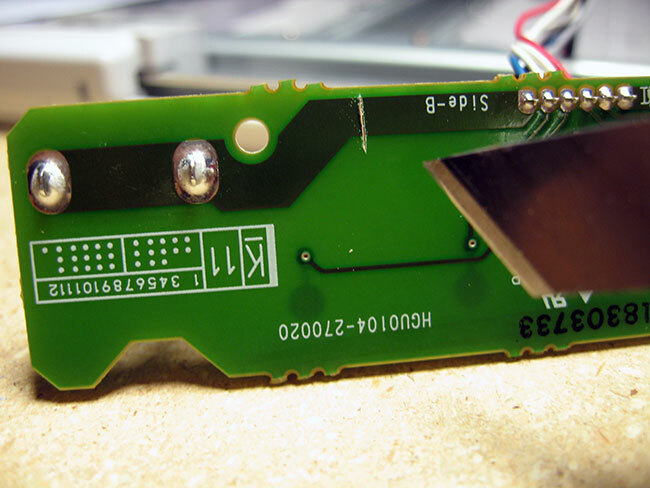 The real benefit of this modification is to no longer have to replace or recharge your batteries. A beautiful, virtually endless flow of electricity for all your fitness needs. 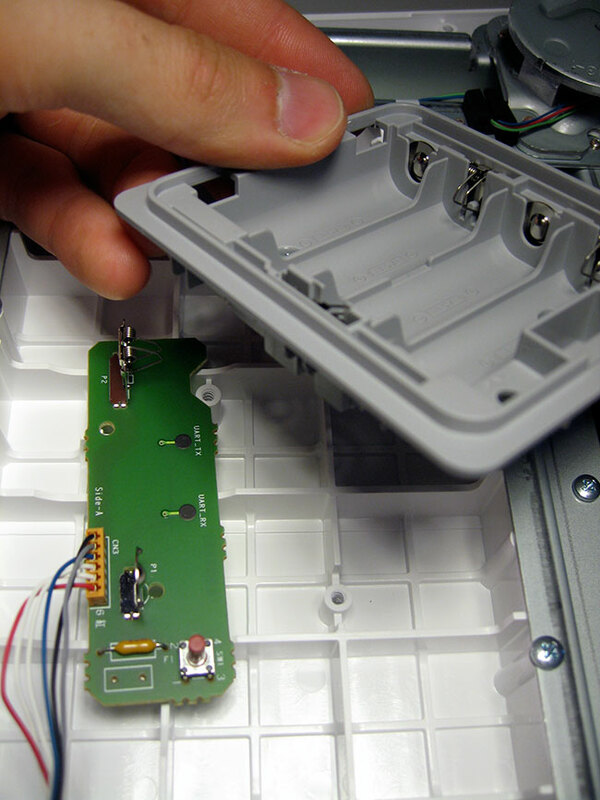 You may also use the modified unit with the original battery configuration if you choose not to use the wall wart at any point. No changes needed. Just unplug it from the wall and re-sync (or pull the power jack quickly and it should switch over to the batteries seamlessly). 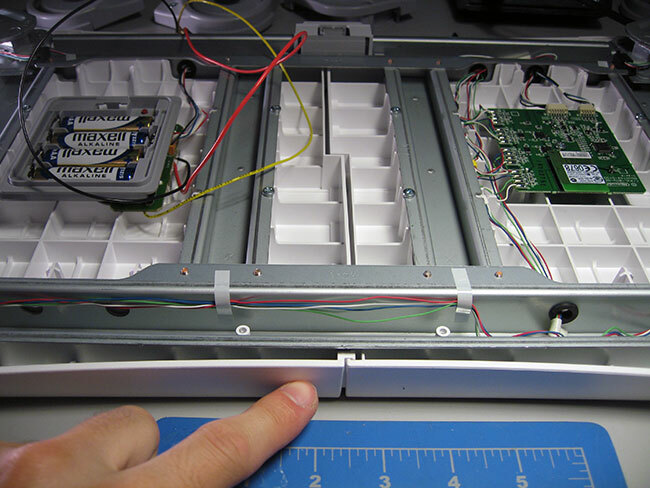 Perfect for an installation or kiosk that uses a Wii balance board. A few feet of wire. Three different colors in a stranded form would be ideal. 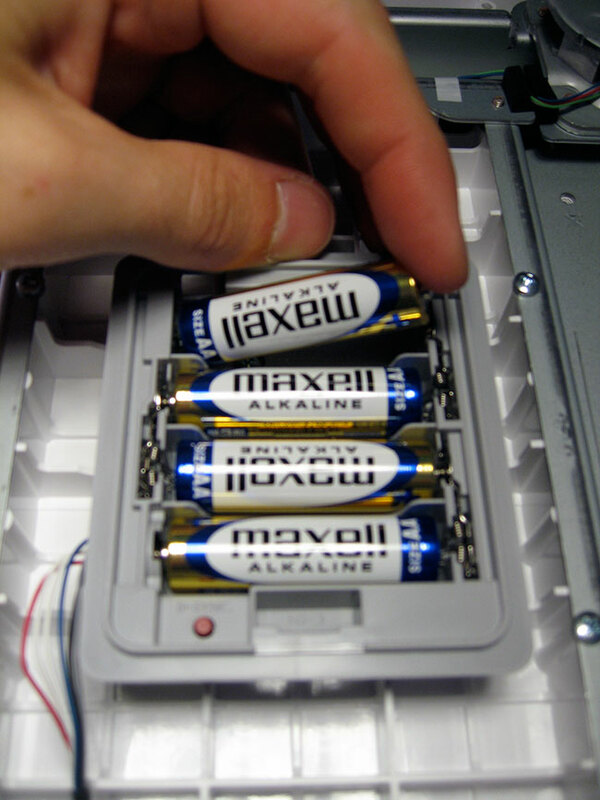 Note: A 6 volt or 4.5 volt power supply from Radioshack should work as well. 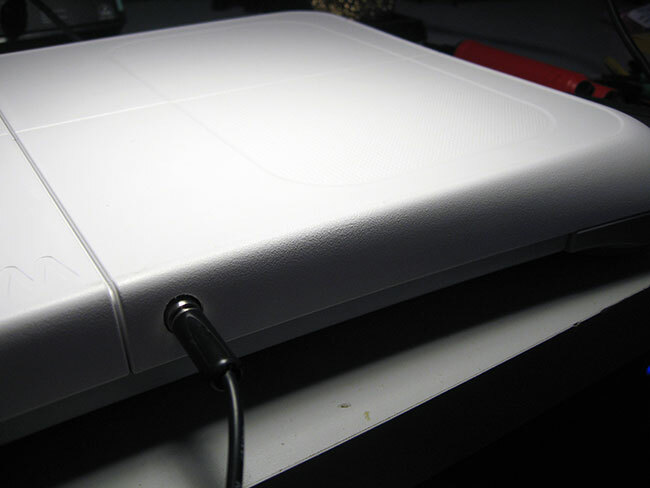 Note: You’ll want to make sure the power supply plugs in nicely with the power jack you choose. If not, pick up a mating power jack as well. 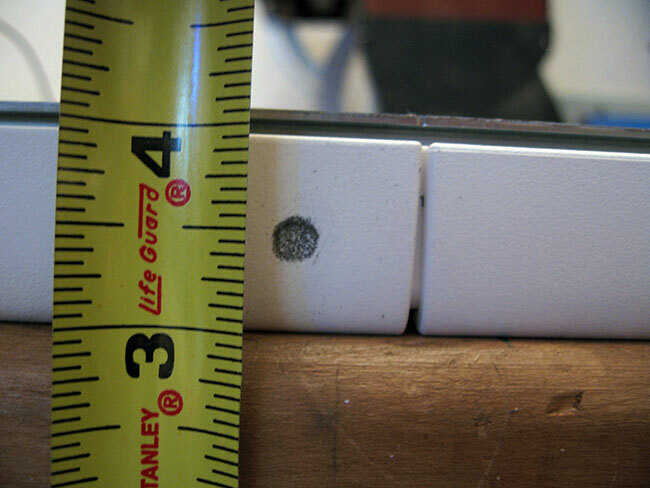 The ID (inner diameter) and OD (outer diameter) measurements need to match. 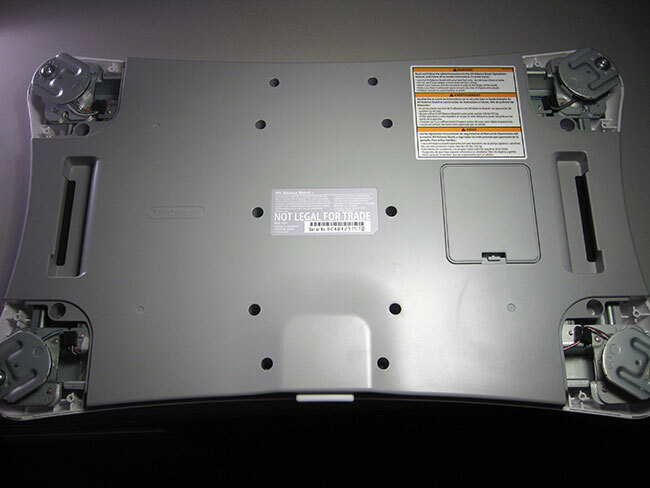 Start by turning your Wii balance board upside down, unscrewing the screws holding the back plastic secure, and then removing the plastic panel. 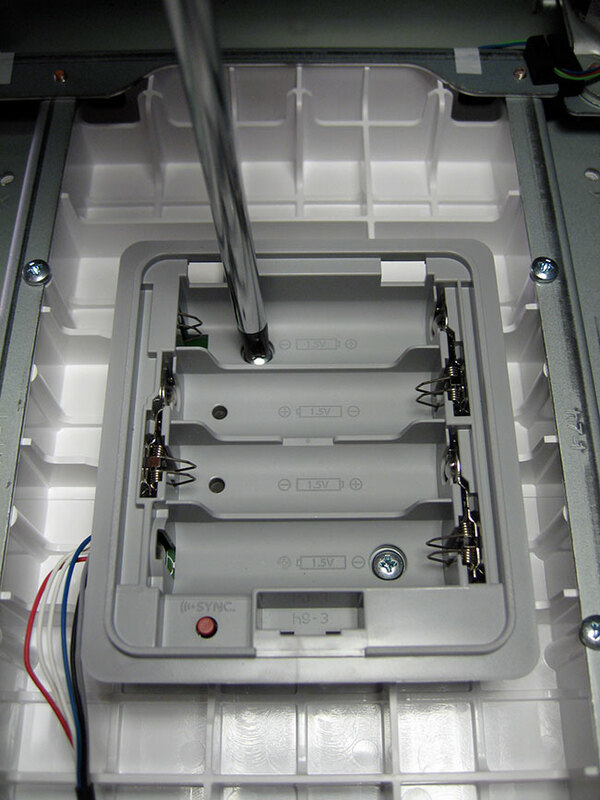 Remove the battery compartment cover and the batteries. 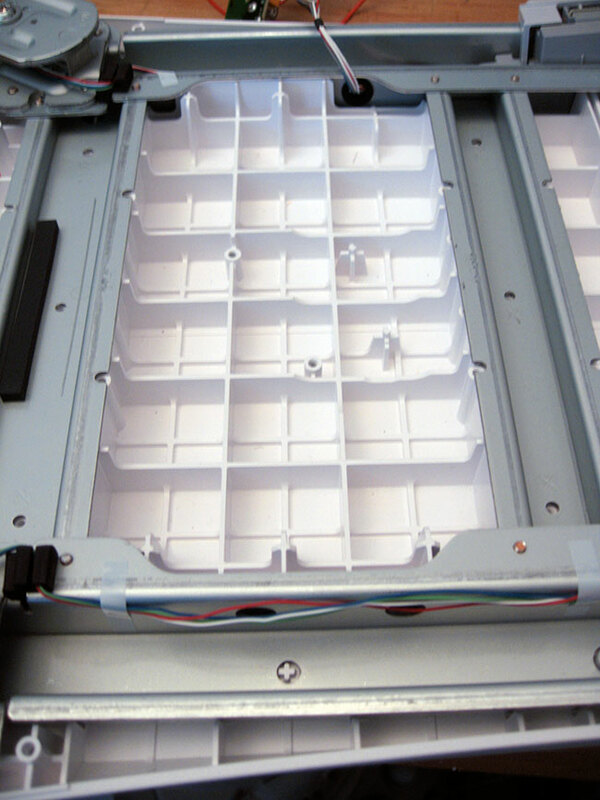 Remove the screws securing the compartment. 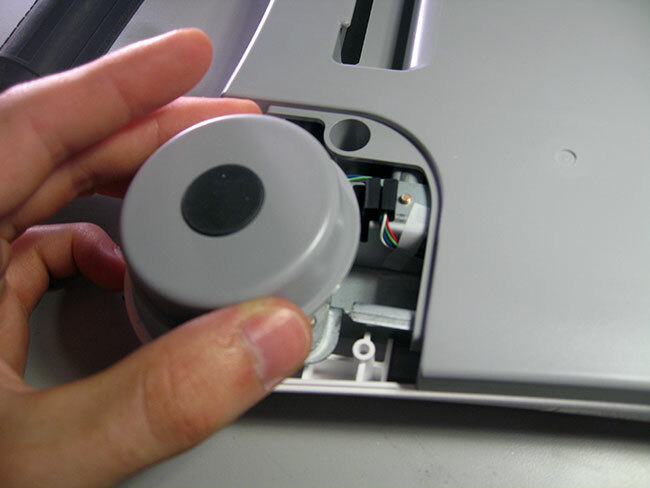 Remove the plastic battery compartment. 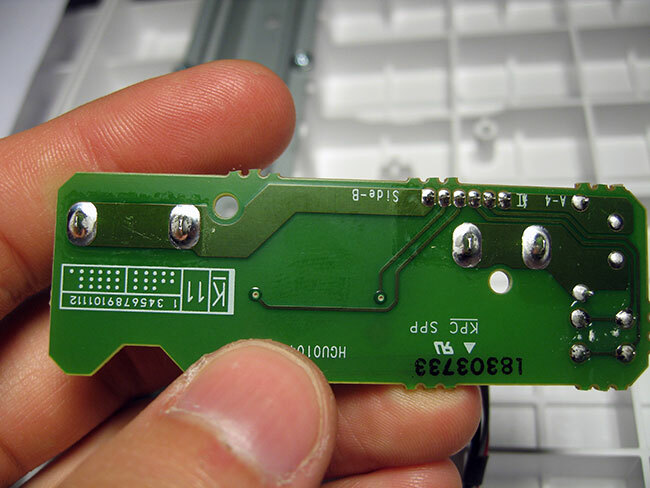 Pick up the battery circuit board and look at the bottom. 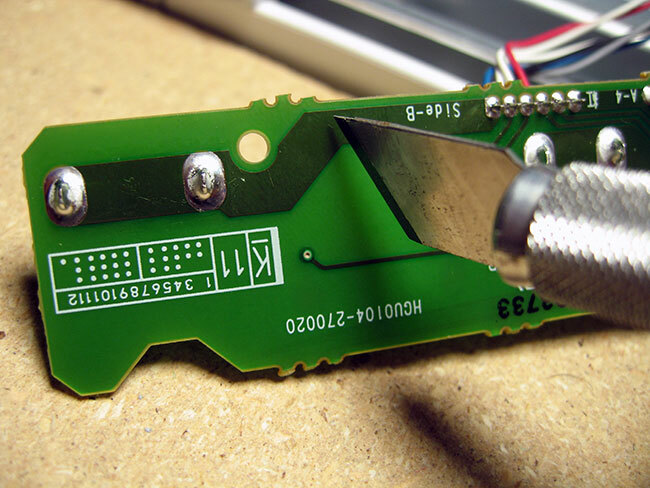 Using an X-acto knife, cut the thick trace between the battery holder and the ribbon cable connector. 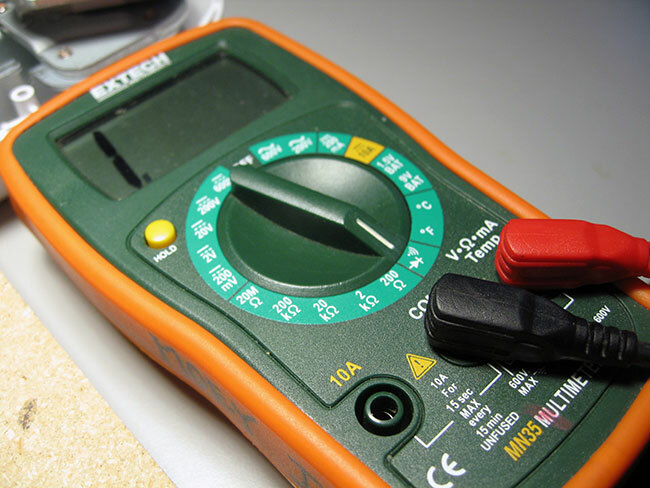 Optional Using a multimeter, test to make sure the trace is truly cut. Set your multimeter to the continuity setting. 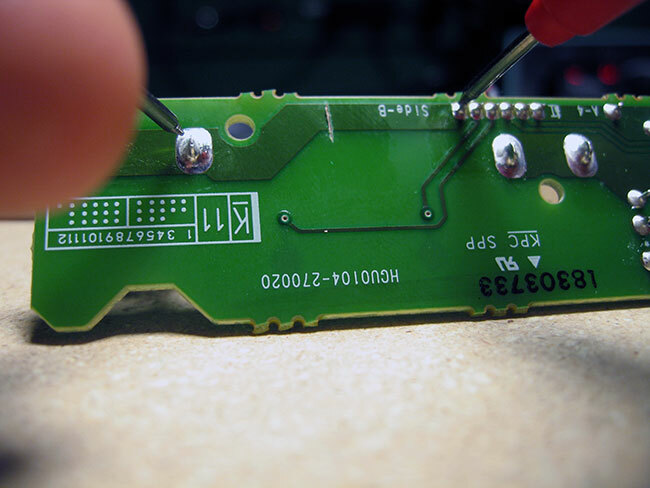 Solder three wires to the battery circuit board. 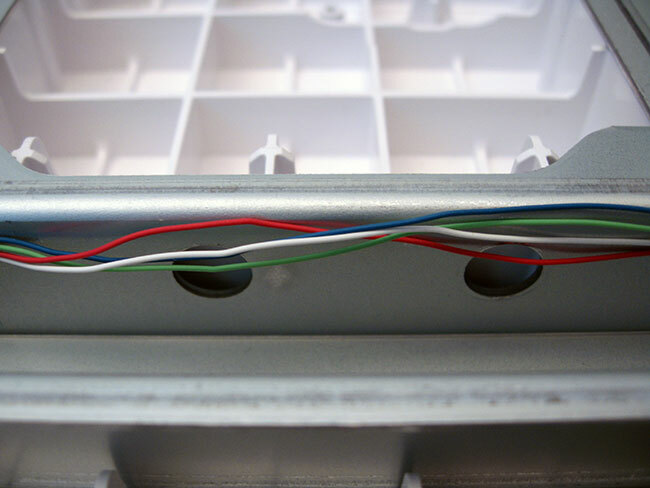 A yellow wire to the left battery holder, a red to the right battery holder, and a black wire to the left most lead on the ribbon connector. We chose to use stranded wire. 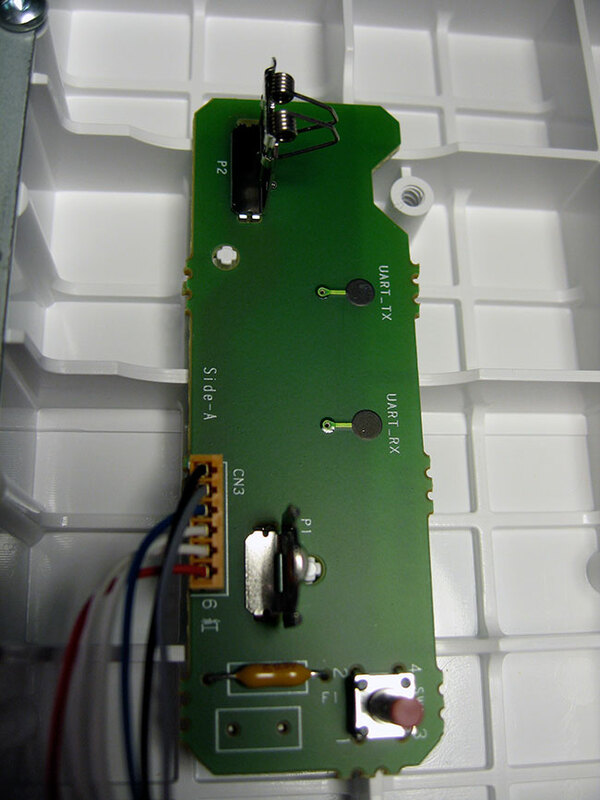 Put the circuit board back into place. 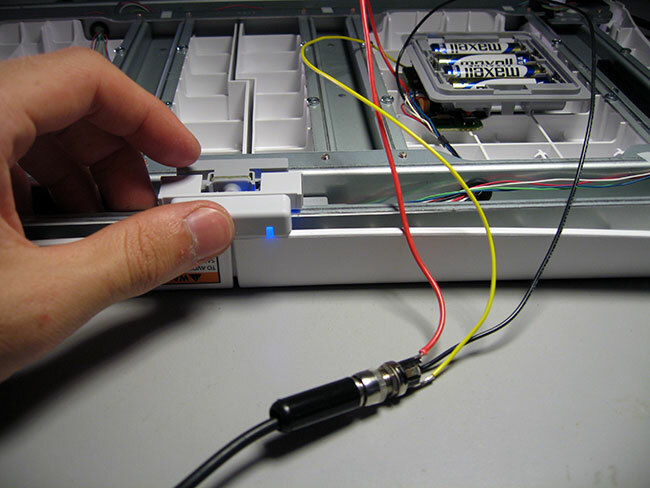 Take your chosen switched power connector and solder the red, black, and yellow wires onto it. 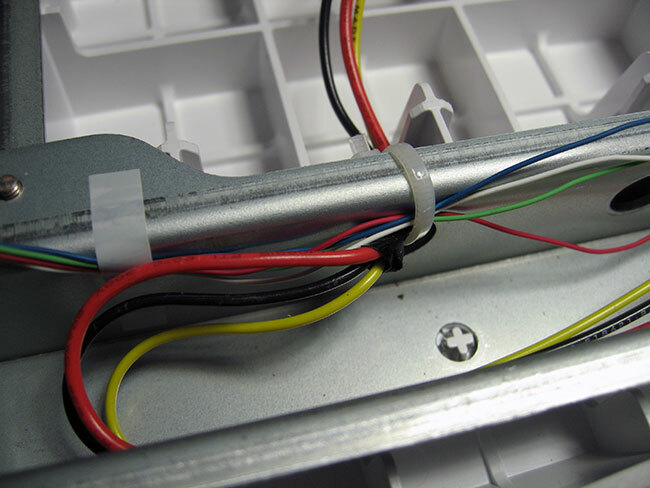 You will probably want the center to be power (red wire), the outer sheath ground (black wire), and you may have a lead labeled switch which should be soldered to the yellow wire. 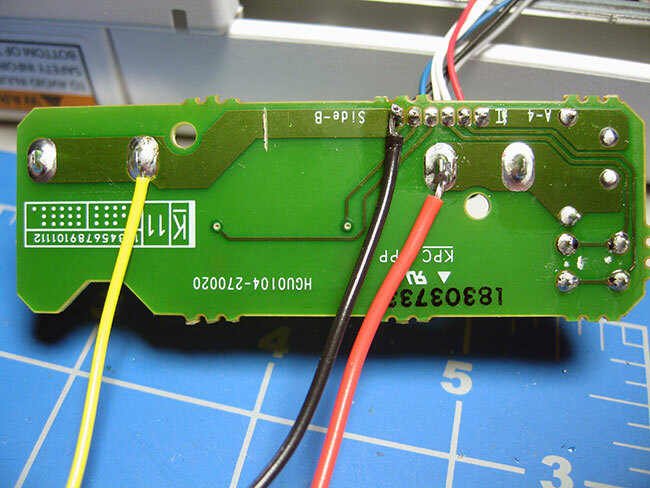 Plug your 5 volt power supply into your newly soldered connector and press the front button on the balance board to see if it will blink. 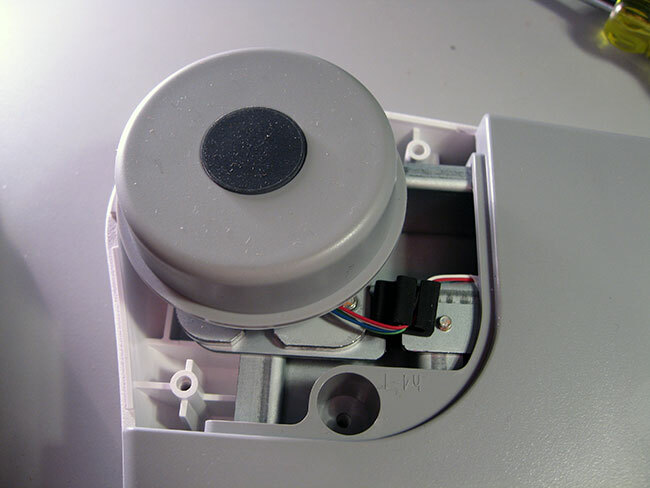 If you put the batteries and compartment back together, you will be able to test the balance board modification with the original battery configuration. This will just make sure we didn’t break anything. 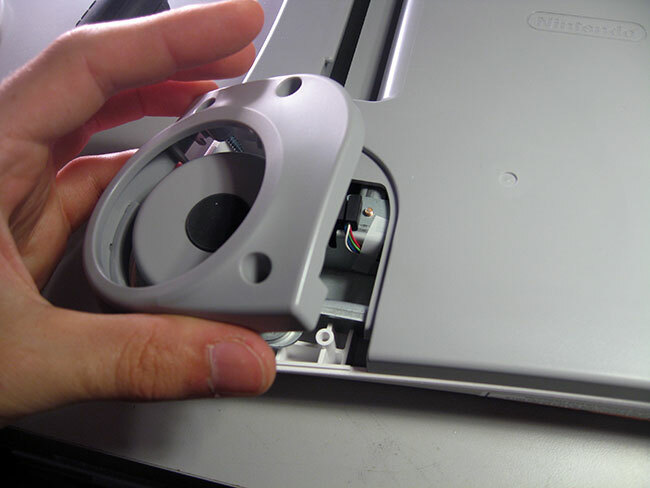 Once we’ve tested our modification, we can go ahead and mount the power connector to the frame of the Wii board. First, pick a place where you’d like the connector to reside. 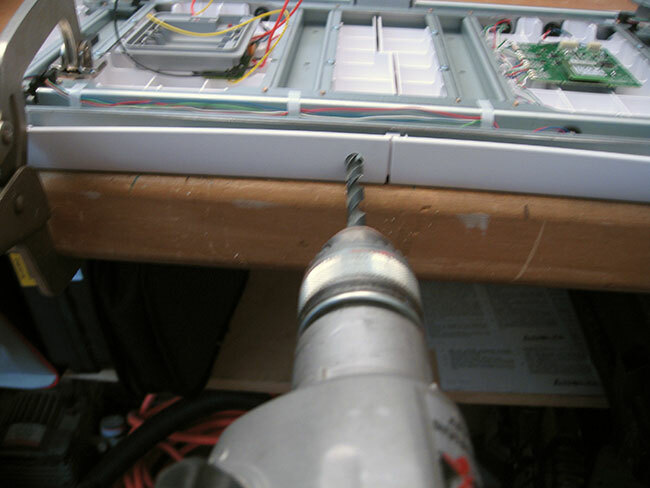 Clamp the board to a sturdy surface so you can drill without it moving. 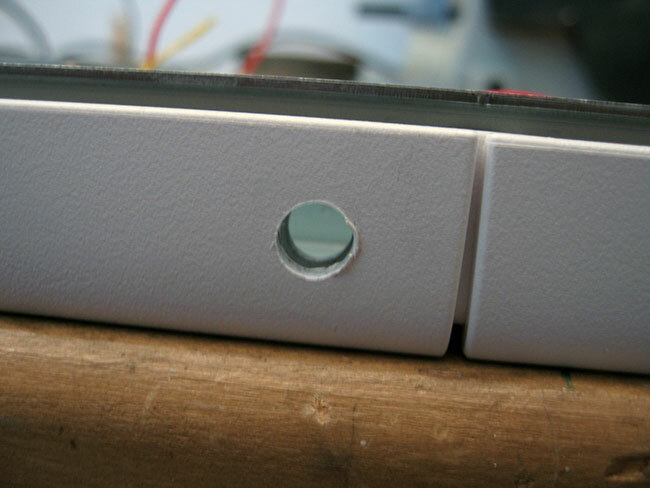 Choose a place to drill the hole and mark it with a pencil. I’ve decided to place it centered a 1/2″ from the top and bottom of the frame. Pick a drill bit that will create a hole big enough to fit the male connector you are mounting to the metal frame. 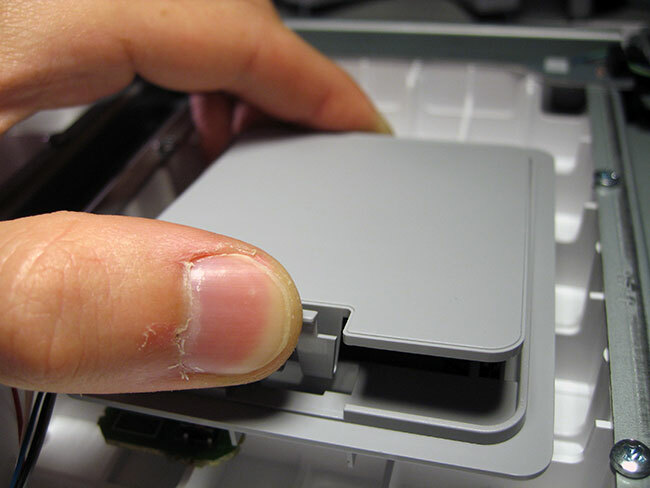 Don’t worry too much about the female connector from the wall wart, this hole can easily be enlarged later. 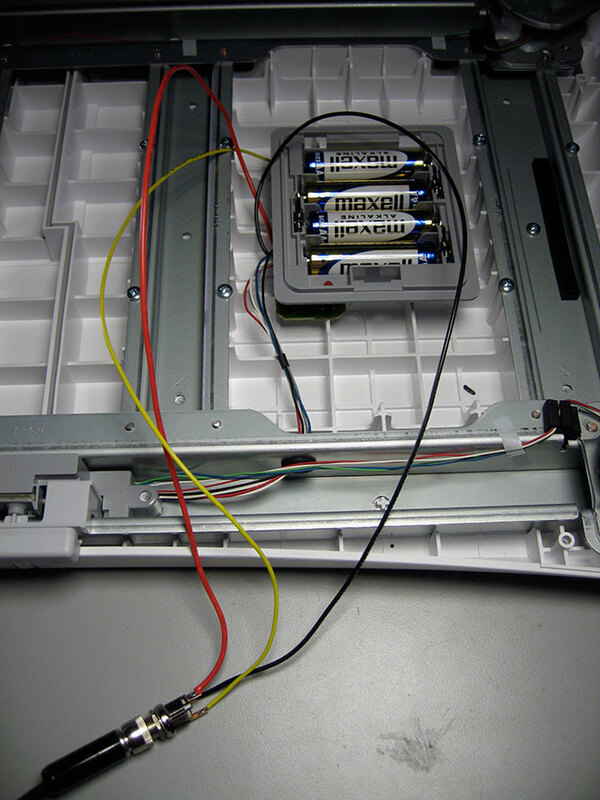 Now, we need to drill another hole so we can route the red, black, and yellow wires from the battery circuit to the location the connector will be mounted. 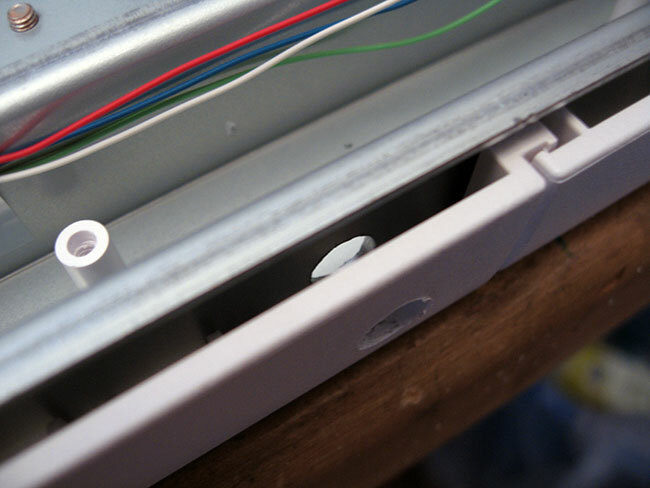 You will notice there are already holes in the metal frame at a convenient location, so we just need to drill the plastic. 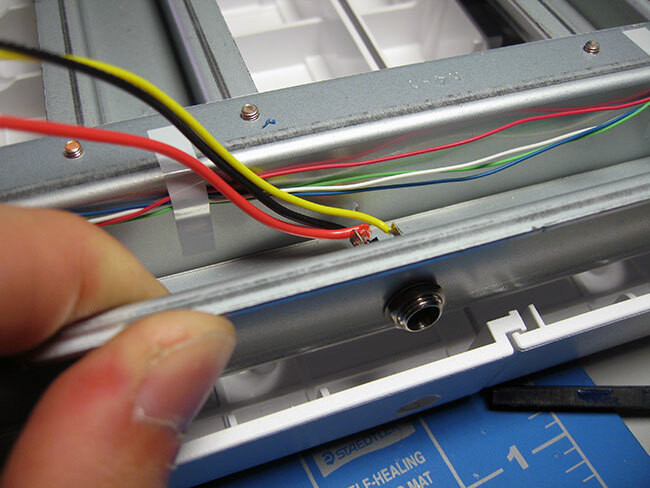 Use tape to pull the existing wires out of the way. You’d probably hate to hit them with a drill. 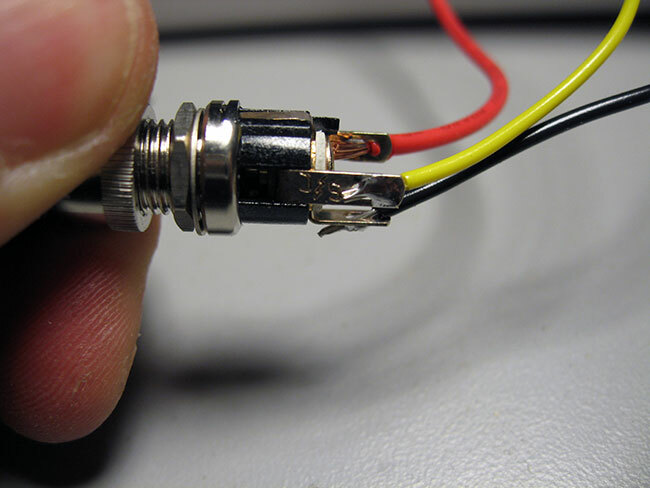 At this point, if you still have the male connector soldered to your red, yellow, and black wires you will need to desolder them. 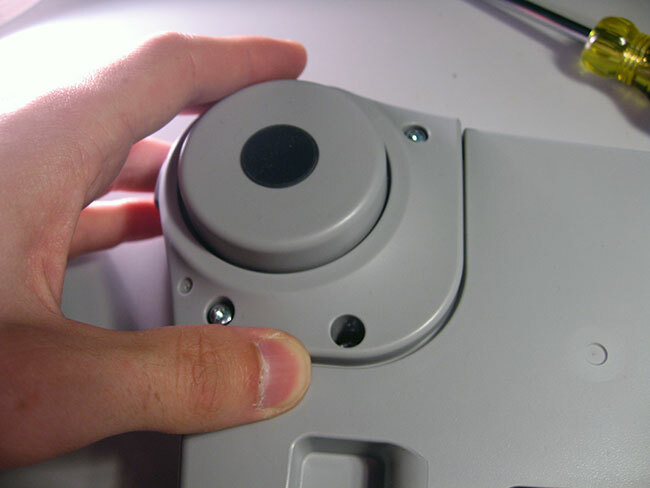 The connector most likely will not fit through the hole you just drilled. 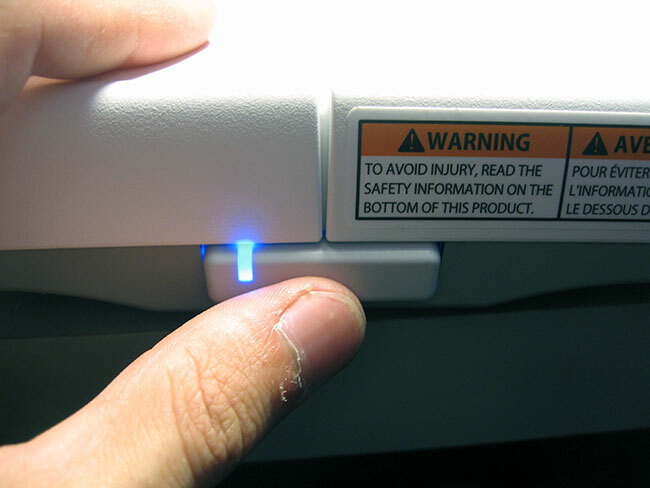 Be sure to take a photo or take note of which wires go where. 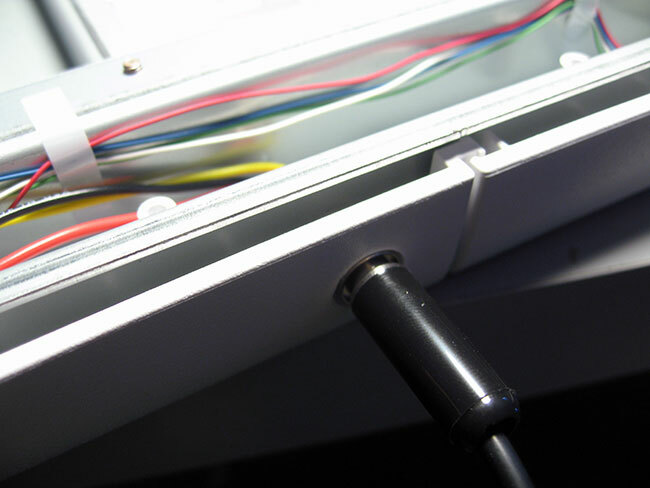 When done, route the wires through your new hole and re-solder the wires back onto the connector. 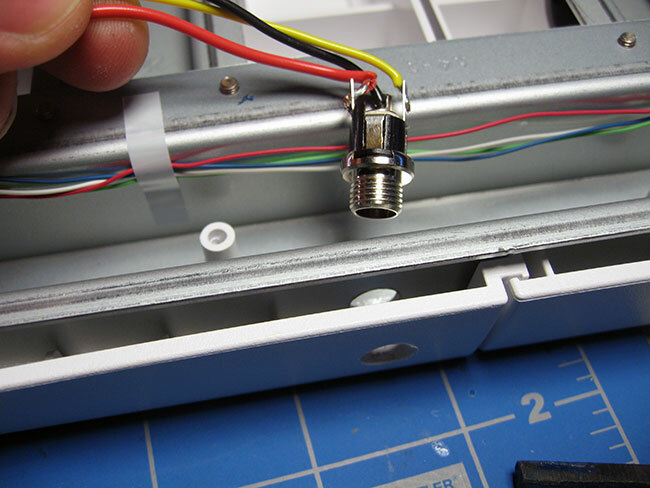 Mount your connector to the metal frame by placing the bushing through the hole and placing the nut over the bushing. 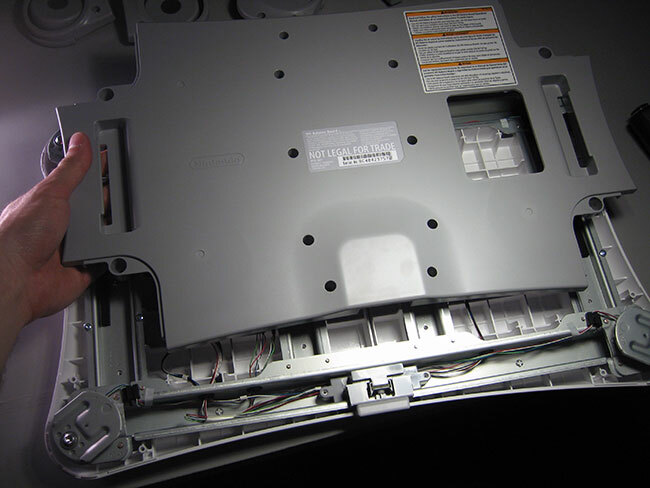 This may be tricky and a pair of pliers may help with this. 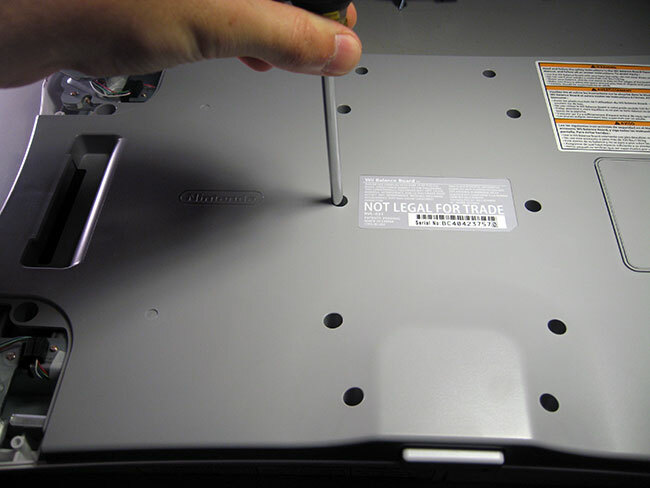 Also, you may try removing any additional screws holding the metal frame to the plastic so you’re able to lift up the frame for easy access to the connector and nut. 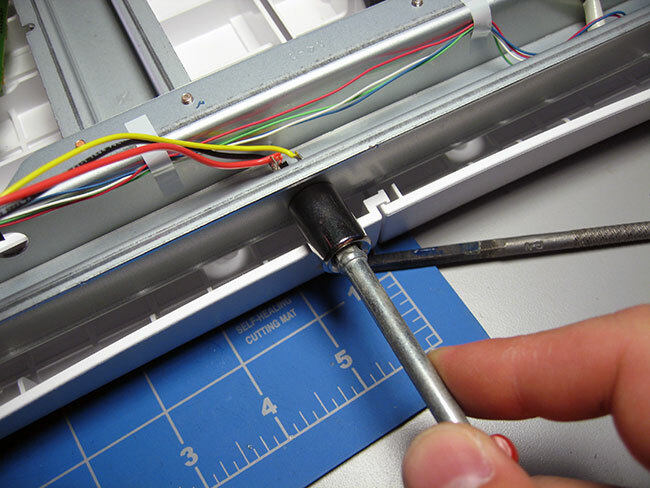 Once the nut is on the connector, consider using a socket wrench to snug it up. 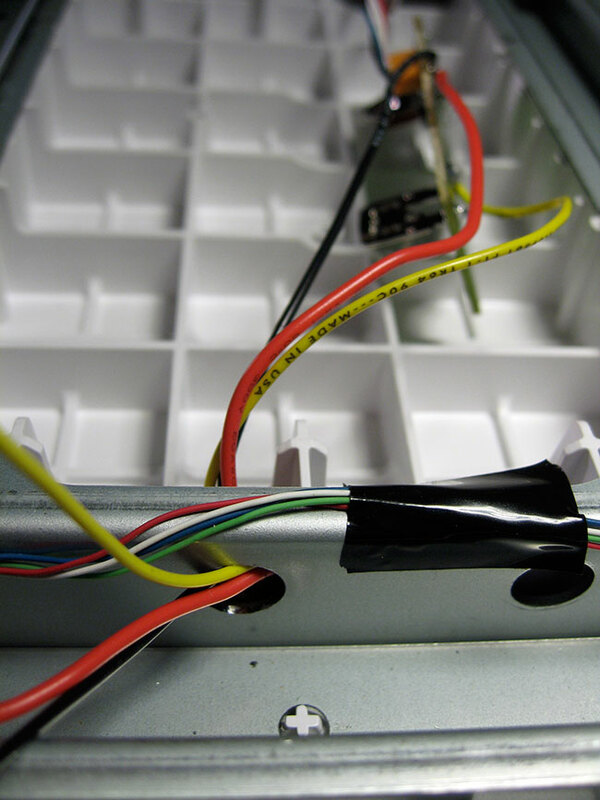 We decided to add a zip tie for strain relief in case the power connector comes loose, and a bit of electrical tape to buffer the wires from the potential sharp edges of the hole in the metal frame. Test to make sure the wall wart plugs in nicely with the connector you just mounted. 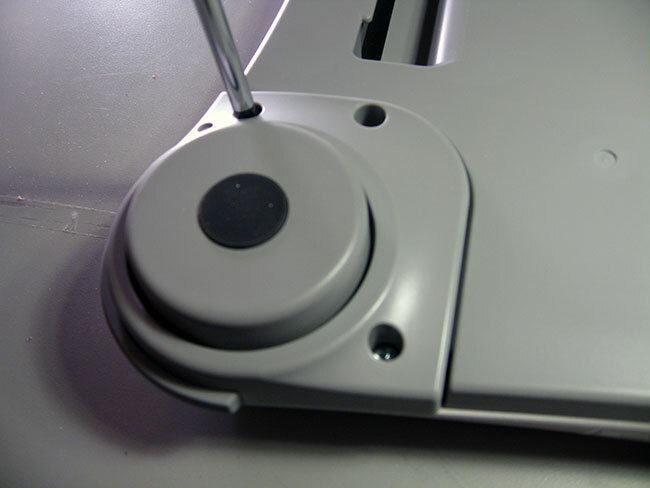 If by chance it doesn’t fit, try drilling a slightly larger hole in the white plastic or using a small round file. 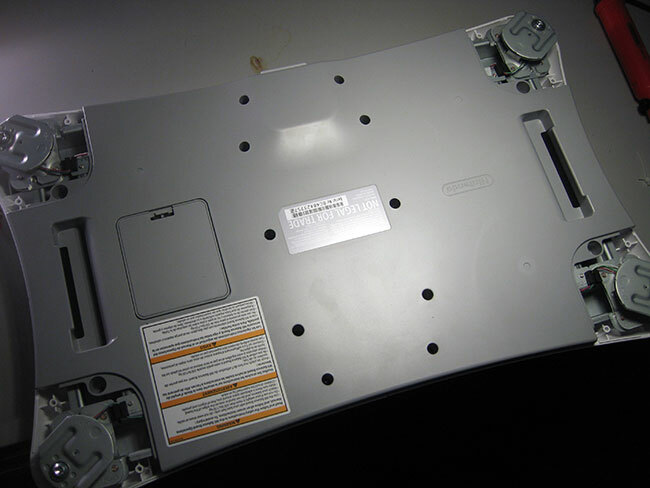 At this point we assume everything is working correctly and we simply need to put the Wii Balance Board back together. 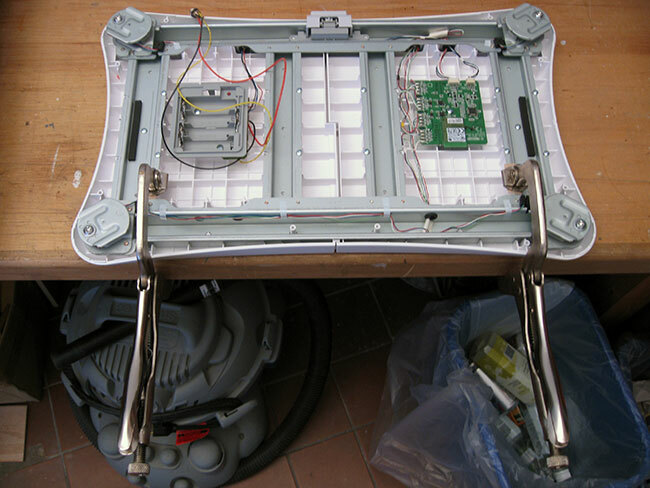 Place the unit on its back and put all necessary screws back into place. 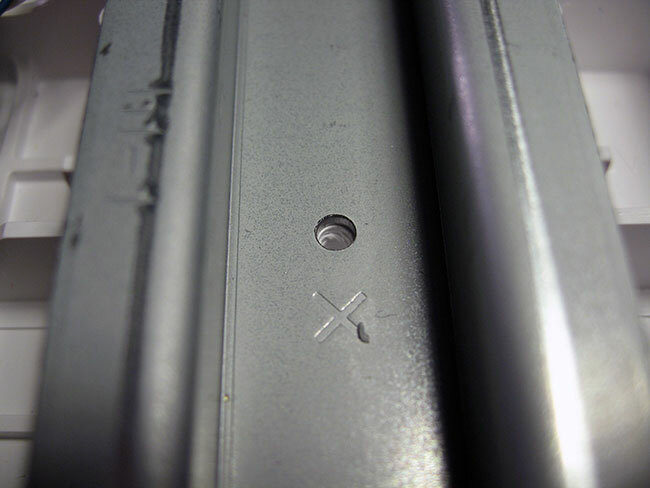 Take note of the X next to some of the screw holes as these are for screws to be put in after the back plastic is in place. 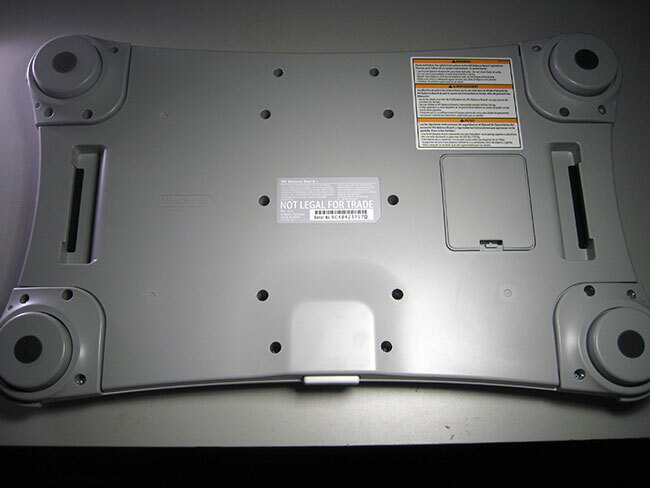 Let’s give the modded Wii Balance Board one final test! If you have any questions or comments, please leave them below as they may be helpful for others following this tutorial.